“Koch Industries, one of the largest private corporations in the nation, operates refineries and manufactures a variety of products. 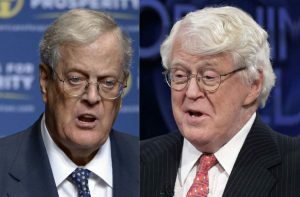 The new tax law — which slices corporate tax rates from 35 percent to 21 percent, slashes estate taxes and includes a special deduction for oil and gas investors — is expected to save the Koch brothers and their businesses billions of dollars in taxes. “Just 13 days after the tax law was passed, Charles Koch and his wife, Elizabeth, donated nearly $500,000 to Ryan’s joint fundraising committee, according to a campaign finance report filed Thursday. “Five other donors, including billionaire businessmen Jeffery Hildebrand and William Parfet, each contributed $100,000 in the last quarter of 2017, according to the records.